The new LJ-TS ‘V’ horizontal screens. Terex Minerals Processing Systems (MPS) says its new Cedarapids LJ-TS ‘V’ horizontal screens deliver “unmatched production”. Customers can enhance operations by replacing their existing triple shaft screens with the new 5 by 16 ft and 6 by 16 ft two- and three-deck addition to its revolutionary line of ‘V’ Series, says a spokesman for the US-based company. The new horizontal screens increase production and handle applications not possible with traditional horizontal screens because they combine the efficient, high g-force El-Jay 3:1 oval stroke motion with variable slope operation to handle larger deck loads. The El-Jay 3:1 oval stroke gives the screen – which is built rugged – the unique ability to install at various slopes, increasing production and handling more applications than traditional horizontal screens. The high g-force, high-efficiency El-Jay oval stroke motion adjusts three ways (speed, stroke angle and stroke magnitude) to optimise performance, he adds. The screens also feature more steel in the rock zone with thicker side plates and heavier decks for industry leading durability; the 5/16-inch (8 mm) Grade 50 side plates are two times stronger than ¼-inch (6 mm) standard steel; and rugged computer-optimised decks with full-length bracing. 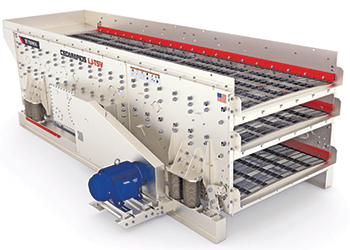 The patent-pending variable slope handles larger deck loads and bigger screen openings to increase production. The screens install up to 10 degrees in 2.5-degree increments to best fit the application or replacement of earlier TSH or TSS models, increasing capabilities to handle larger deck loads and bigger screen openings. Other new features of the LJ-TSV screen to boost productivity incude the patented low-maintenance vibration damper system and the patent-pending optional bottom deck deflector plates that increase efficiency. In addition, the patented “flow-through” lubrication system and “sealed-for-life” double O-ring assembly extend equipment life. Plus, the medium scalper option increases feed size from 10 to 14 inches (254 to 355 mm); with options including side liners/extensions. Terex MPS is part of Terex Corporation, a lifting and material handling solutions company reporting in five business segments, including aerial work platforms, construction, cranes, material handling and port solutions and materials processing.